Chocolaty and with a tender, moist crumb, this cake simply sings with the flavors of the holiday season. However, it's also fabulous at a summer picnic. Lower in fat than many dessert table indulgences, you won't feel guilty when you reach for slice number two. 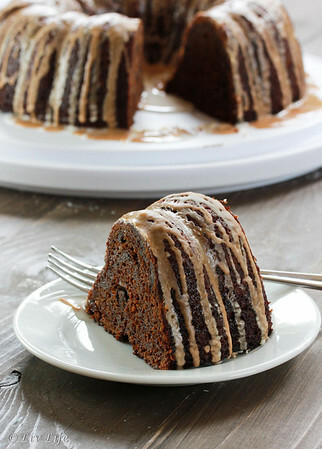 Preheat oven to 350º and coat a 12-cup bundt pan with cooking spray. Set aside. Whisk all-purpose flour, pastry flour (or spelt), granulates sugar, cocoa, baking powder and soda, spices and salt in a medium bowl and set aside. Pour the buttermilk (or almond milk) into a large bowl and add the pumpkin puree, and brown sugar. Mix with an electric mixer (or alternatively work with a whisk) on low speed until fully incorporated. Beat in the whole egg and egg white. Add the oil, corn syrup (or maple syrup) and vanilla and continue to mix or whisk until incorporated. Pour the batter into the prepared pan and then place into the oven. Bake until a wooden skewer inserted into the center comes out with only a few moist crumbs attaches, about 1 to 1 1/4 hours. Remove from the oven and place the pan on a wire rack. Allow to cool for 15 minutes then remove the cake from the pan and allow to cool completely on the rack. Glaze: Combine the powdered sugar and milk in a small bowl. Whisk until completely smooth. Place the cake on a serving plate or other board and drizzle glaze over the top of the cake. Next, combine the Spiced Glaze ingredients and again, whisk until smooth. 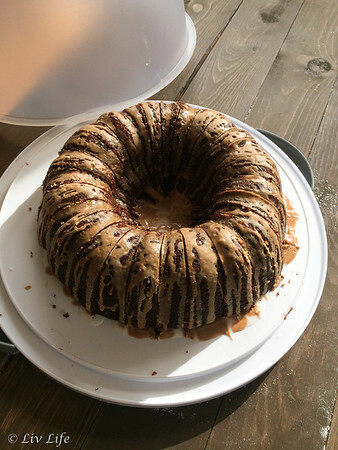 Drizzle spiced glaze over the top of the cake and allow both glazes to set, about 1/2 hour. 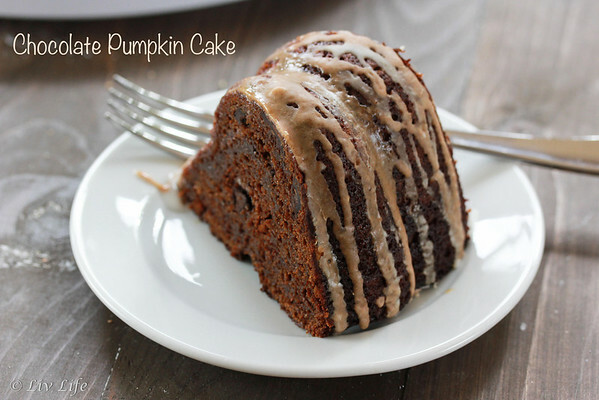 I SO need to make a gluten-free version of this cake!!!! And, double glazes? Yes, please! !